So, my kids are not the normal cake kids when it comes to birthday treats. They would go for cookies way before they would go for cake. Normally, that is not a problem here, but when it comes to birthdays, that normally means dropping $40 for a cake. That is a huge hit for someone that is not afraid to make get in the kitchen and bake! I am of the opinion though, that you get what you want food wise on your birthday. That is the way I grew up and let's be honest, as you get older, really that is the highlight of the day! So, this year, my oldest son asked for me to make a cookie cake. I have to admit...I got scared. Cookies are one thing, but a huge cookie...that can lead to some problems! So, I did a little research and came across this recipe from allrecipes.com. I read the reviews, took a deep breath and off I went to see what kind of mess I could make out of the cookie cake. I realized half way through the process that I did not have a true pizza pan, so I had to improvise with a cookie sheet. I had no illusions that it would work, so I just did it and hoped for the best. The only changes I made were to use Earth Balance and I baked it in a different pan (oh and no nuts for this clan). I also bought the icing because I knew what Jay wanted on it. In large bowl, beat dairy free butter, granulated sugar, brown sugar, and vanilla until light and fluffy. Add eggs, one at a time, beating well. In a separate bowl, combine the flour, salt and baking soda. Add the flour mixture to the sugar mixture and beat until well blended. Next add the chocolate chips. Spread on a parchment lined 10 1/2x15 inch cookie sheet or 14 inch pizza pan. (I refrigerated the cookie on the pan for about 30 minutes at this point) Bake at 375 degrees for 18 to 25 minutes. 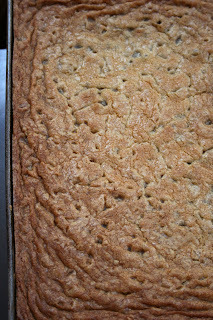 Cool cookie in pan on a cooling rack. Decorate as desired. Oh wow!!! I love cookies but I hate making them. I'm more of a muffin person. This looks like my perfect cookie!! i assume it was good since you posted the recipe? i never though i could make a giant cookie, but you've given me inspiration! 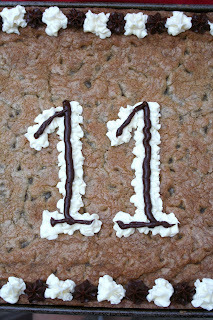 Ooh la la - you've now planted the idea in my head that I want a cookie cake this year instead of cake-cake! Your boys are smart - I'm with them on the "cookies trump cake" thing. 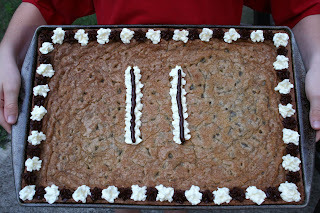 Sooo...now I've got three reasons to be excited to turn 21: a. so I can buy beer to BAKE with, b. so I can buy white wine to COOK with, and c. so i can have a cookie cake. My priorities are in line, don't you think? !